Four New Jersey lawmakers sent a letter to Interior Secretary Ryan Zinke and asked him to keep drilling operations away from their state. A bipartisan group of New Jersey lawmakers sent a letter to Interior Secretary Ryan Zinke asking to keep offshore drilling programs away from their state. New Jersey Gov. Chris Christie, Gov.-elect Phil Murphy and U.S. Sens. Cory Booker and Robert Menendez signed the letter. 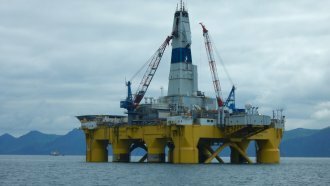 Earlier this month, the Trump administration started taking steps to dramatically increase offshore drilling. But Zinke later said that expansion wouldn't apply to Florida because the state relies heavily on tourist traffic. The New Jersey lawmakers said the same rule should apply to them. In the letter, they say an oil leak could hurt the state's economy and "unique marine ecosystem." They also say the New Jersey "coastal economy generates millions of dollars in revenue" and claimed it provides hundreds of thousands of jobs. New Jersey isn't the only state asking to be exempt from future oil-drilling projects. Some lawmakers from North Carolina, New York and California have also said they want their states exempt.